Playing games as a career? 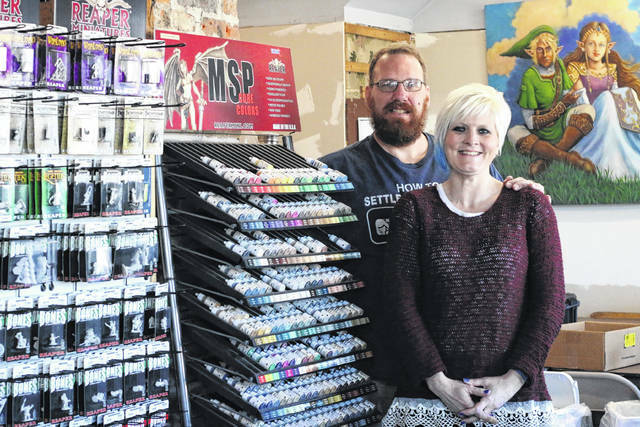 Erin Miller | Galion Inquirer Citadel RPG and Gaming owners Andy and Diana Nolen are shown inside their business located at 343 Harding Way East in Galion. After one year in business, the Nolens are growing their business and looking to the future here in Galion. GALION — Galion’s Andy Nolen has been into gaming since he was a kid. Now, as an adult, he is turning his childhood passion into a local Galion business. Nolen grew up playing Dungeons & Dragons with a group of friends. “It stuck with me,” he said. A role playing game (RPG) store was something Nolen had always planned to do, but life and family took priority. He worked as a corrections officer for 20 years before deciding to take the jump into owning a business. “Until the past couple of years, it wasn’t a sustainable thing for me to be able to quit my job,” he said. With the support of his wife of nearly 25 years, Diana, Nolen left his job and started the process of looking for a store front to open a business. After finding nothing available soon enough to open a store, Nolen stumbled across the building that was for sale at 343 Harding Way East. The Citadel RPG and Gaming opened soon after, in January2017. Now, after one year in business, the Nolens are seeing growth and continuity in their adventure. And their business is a team effort. During a normal business day, Diana spends most of her time at the counter working with customers or painting miniatures or models for customers. Upcoming events at the Citadel include Geeky Coloring, a free event open to anyone, and a Warhammer 40K miniature based gaming event this Saturday. As the Nolens look ahead, they hope to continue to reach gamers locally and beyond. Recently, they have decided to hold Pokemon tournaments at the Big 4 Depot Pavillion in order to accommodate the number of guests attending. Attendees have come from as far away as Michigan, Indiana, and Cincinnati to participate. https://www.galioninquirer.com/wp-content/uploads/sites/38/2018/02/web1_IMG_0559-2.jpgErin Miller | Galion Inquirer Citadel RPG and Gaming owners Andy and Diana Nolen are shown inside their business located at 343 Harding Way East in Galion. After one year in business, the Nolens are growing their business and looking to the future here in Galion.